Announcing the New Heather Bailey Store! 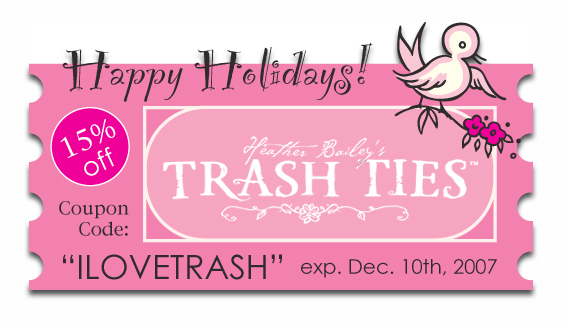 We've launched our new online store at www.HeatherBaileyStore.com where you can now purchase Trash Ties at a new, lower price, along with Heather's other designs, including fabrics, sewing patterns & paper craft supplies. Our new store is very customer-friendly, far more flexible on shipping options than our original Trash-Ties-only store -- and super fun to shop through. So, come see us at HeatherBaileyStore.com. Our original Trash-Ties-only shopping site is no longer. Links from older posts will not necessarily direct you to the new site. Please let us know if you discover any dead-end links that we might need to re-link to the new, upgraded shopping site. Thanks! There's a new face around the studio lately and a new coiffure. Meet Tara. Yes, we should have thought to photograph her face, but were too excited about her awesome hair-do to think that clearly. Isn't this beautiful and fun? This is how she came to work. No help from us. 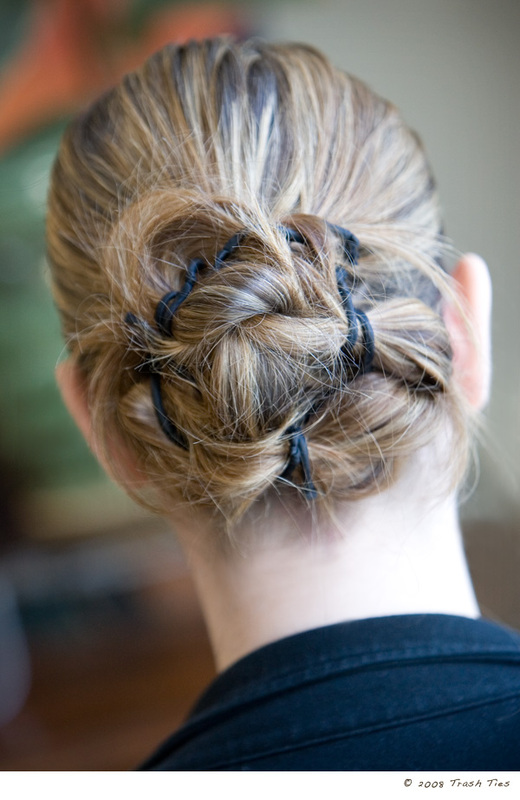 And the Tara Bun (why not) is a great style for everyday wear, elegant yet casual, tidy yet playful. Boxes & boxes of Trash Ties have been shipped since our launch and now it's time to show off your Trash Ties dos. We've started a Flickr photo group where you can browse for Trash Ties ideas posted by other customers like you or add your own (yes! even better). It's easy and free to join. Click here to take a dip in the Trash Ties photo pool. We're just getting started, so go add your photos to the group. And check out this amazing hair-do too! Ainslie, you do us proud. Watch for customer features in upcoming posts (send those photos in) and keep an eye out for our first official Trash Ties contest this Spring 2008 -- big, crazy prizes! 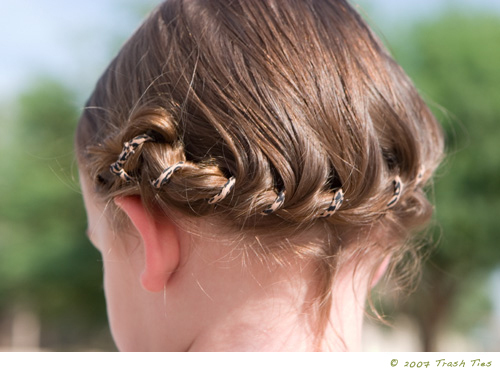 Here's a fun braid-around-the-back with a little flourish at the side. What should we call it? It reminds me of the late 30s/early 40s. Or is it Debbie Reynolds in Singing in the Rain? Maybe we should call it The Cutie. Easy to do. Pull back a portion of hair at the front top of your head and wrap with the end of a Long Trash Tie (once or twice, tightly). Grab more hair below that, then wrap again. Continue in this fashion around your head. 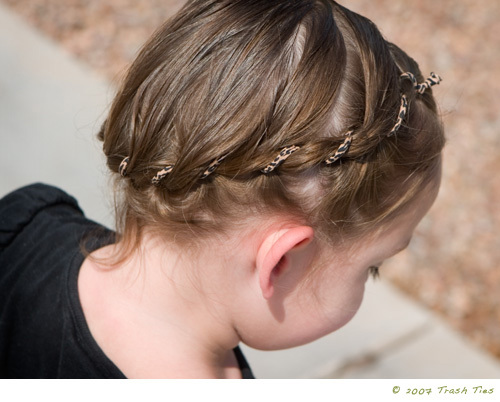 (More photos of braiding here.) When you've reached the other side, you'll have some variety of side ponytail to fasten, depending on your hair length and thickness. If your hair is fine and not very long (like Charlotte's here) you might have enough Trash Tie left to wrap around the rest of your hair and make a bun, as in the top photo. See this page for bun instructions. 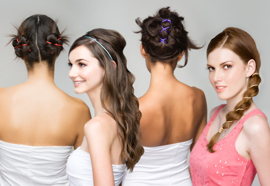 If your hair is thick and long, you could wrap the remaining length of the Trash Tie around your hair to make a side ponytail or use an additional long Trash Tie or set of Standard Trash Ties to fashion a funky side knot, twist or bun. Get those cogs turning. We'll have some photo groups set up within the week! Lots & Lots of Boxes! 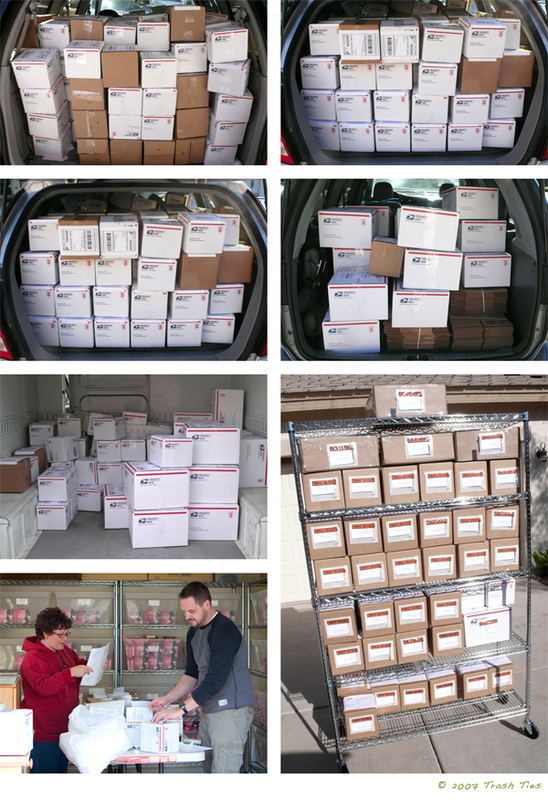 This is the shipment that went out last Monday -- the first wave of orders was tidal! Each of these van-loads was full to the brim (though I didn't get a picture of trip #2, so there's a duplicate photo in there to represent the missing picture). From creating your Trash Ties to order, to packaging, boxing, labeling, updating, and so on, these orders were completed in record time -- and we should have handed out green stocking hats and pointed shoes to the friends and family that stopped by to help. We all have a greater appreciation for Santa's elves! The customs forms alone took a day to complete. And it took one person a full day and half just to mark the orders as shipped in the computer. Thank you, helpers! Now everything is onto a steady pace and all orders from December 11th and on will be subject to the work-flow we've implemented these last two weeks. Thank you everyone for your enthusiasm. And thank you for your patience. There are only two of us to manage every step of this process thus far, from raw materials to completed shipments. It may take a couple of days for an inquiry to rise to the top of the pile, but we intend to address each and every concern in turn. And thank you again! We received four times more orders than expected the first day the cart was open alone. And we've done it! In the last two weeks, we've converted our garage into a shipping center, implemented an order work-flow system, and made and processed every order from that first busy week. Christmas is now three days away and our home still lacks any evidence of the holidays. Tonight is the beginning of what we've coined, "Crazy Christmas," Christmas in a flurry -- all Christmas, all day, for three days straight! We'll continue to create your Trash Ties over the holiday, and will begin shipping again once Christmas has passed. Moving forward, as stated in the welcome page of the Trash Ties store, please expect a 2-4 week lead time before shipping to allow us time to create and package your Trash Ties, and handle all necessary paperwork and filing of information. We're excited to show you some new hair-dos in the coming weeks, start up some photo groups, and see your Trash Ties in action. Watch for an over-the-top contest as well - prizes too! • Shipping -- We're planning to send all orders that were received by December 10th out on Monday or Tuesday via Priority Mail for the US (3-5 days shipping) and International First Class for non-US orders (6-10 days shipping) if not sooner. Everything is currently made-to-order, so our home has become a flurry of pink boxes, quite the workshop. Normally shipping will require a 2-4 week lead time to get product out our doors and on its way, but we were willing to burn the midnight oil to get these first orders out for the holidays. We're keeping our fingers crossed, as this is our first go at this and we have a lot of systems to put in place. • Holiday Discount -- We're extending the coupon from HELLOmynameisHeather through the end of the year. Though we can't guarantee delivery for Christmas on orders received after December 10th, we figured we could certainly extend the discount -- Happy Holidays! • And Speaking of Coupons -- Please make sure to press the "Apply Coupon" button after entering a coupon code and verify in your order summary that you've indeed secured the discount before submitting your payment. 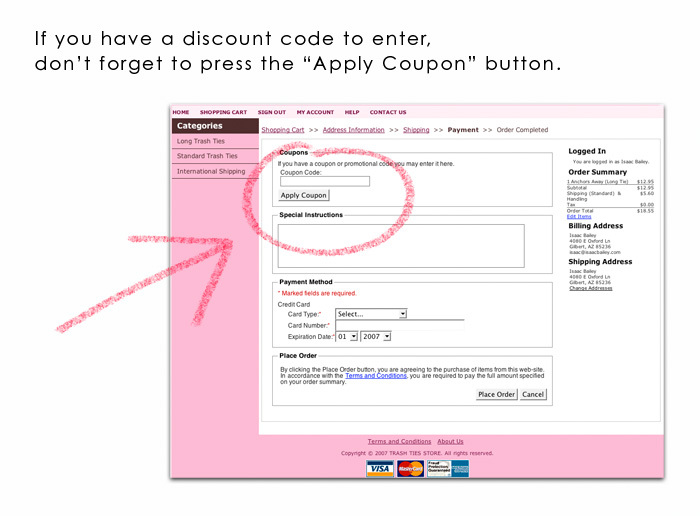 We don't have any way to edit your order, so we cannot apply any discounts after your order has been placed -- so watch for that "Apply Coupon" button. Thanks! • A Word on Security -- The Trash Ties store is a secure place to shop. It is operated under an SSL certificate through GoDaddy.com, which is a large and reputable company. Some web-savvy shoppers have pointed out that when shopping at the Trash Ties store, the URL does not read "https" instead of "http," which is a quick way to verify security. We've double-checked this issue with GoDaddy and it has been made clear that the "https" doesn't show up because our store is housed in an inline-frame (which allows people to shop without leaving our pretty Trash Ties website). Housing the shopping cart in this inline-frame in no way compromises its security. For those who would like the added comfort of seeing the "https" show up in the URL, you can visit our shopping cart directly at the following address: www.shop.trashties.com. The "https" will show up when you go to enter your credit card information. It is the exact same secure shopping cart as the one at TrashTies.com. Your credit card information is secure. And that's my list for now. I'll pop in again if I think of anything else. And, again, thank you for your orders. We're working as hard as we possibly can to get them to you quickly. Oh, and way up above! 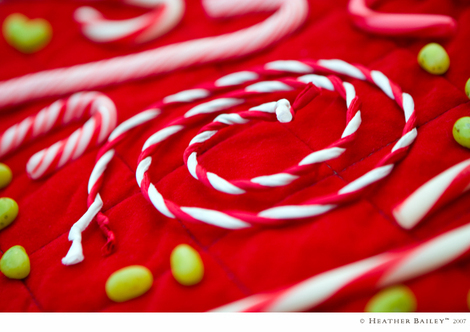 For holiday hair, twist two long Trash Ties together before styling -- Vermilionaire red & White Wedding white -- the perfect disguise for your next stroll through the seven levels of the Candy Cane Forest! Finally! After a long time in the works and hardly any spoilers (an achievement on its own! 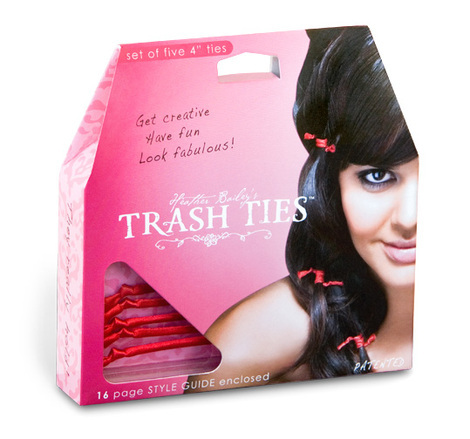 ), here are Trash Ties in their first, fully-patented, worldwide reveal! Where to start? This invention is such a large part of my personal and business history. My adventures in developing, patenting, and preparing every aspect of this product have had enormous influence on the designer and business woman I am today. So What Are Trash TIes?? I've put together How-To pages that go over the basics for each of the Trash Ties products: Standard Ties & Long Ties. These pages are smothered with photos and will tell you everything you need to get started. All kinds of fun ideas. And, Isaac has now wrapped up the first edition of the Trash Ties website, where you'll find a snappy slideshow of hairstyles, further product info, press stuff, and the Trash Ties store, where you can browse every color currently available, all with silly names like "Gold Digger" and "Pink-a-Boo." And we made it in time for Holiday shopping -- Phew! Close one. • Lightweight and easy to wrap, ship, pack in a suitcase, etc. • Useful, but also incredibly entertaining and fun! 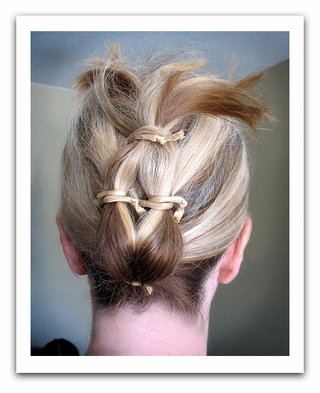 Trash Ties can create all of the standard hair-dos: barrette, ponytail, headband, and so on; you need not be a grand hair adventurer. But, oh, the fun you can have when the mood hits! In coming posts, I'll show you all sorts of elegant hairstyles and a whole slew of playful ones. 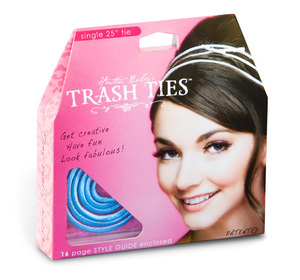 But, for now, go get some Trash Ties so you can play along with me! Orders received by the end of the day on December 10th should be in your hands in time for Christmas giving. (After December 10th, we'll do our concerted best to get them to you in time.) And, yes, international orders are welcome! Follow the symbol at the right for international shipping instructions. I'm still learning time lines for international shipping, so the "concerted best" will have to apply here as well. With clear instructions, we can totally ship them directly to your loved ones as well, just add a note to the order. Hmmm. What else? The shopping cart is set up to give you the same shipping price for 1-4 units or 5-8 units and so on, so buy lots! Don't forget to look over this page and this one -- it's where all of the fun is! And, thanks for coming by. This is a big, big deal that we've made it to this point. I'm excited to finally talk Trash! 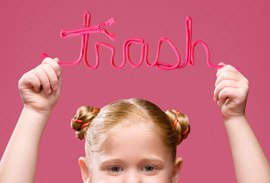 And yes, those were Trash Ties in my hair last Easter : ) You guys were totally on to me. A few of you had difficulty paying through PayPal earlier today. I wanted to let you know that Isaac has since worked with GoDaddy to implement a solid and secure solution that allows you to pay directly in the store. Now everything is working smoothly! I apologize for any inconvenience.